Back from my short Easter break, I want to start with the description of a fine tsuba which was on display at the this years January NBTHK-EB meeting in Bonn, Germany. The special aspect of this tsuba is on the one hand and apart from the excellent workmanship, that it shows a very rare motif for sword fittings, namely an elephant, and on the other hand that works of this artist are in general very rare. Thus, and although I repeat myself, this tsuba might best be described as true rarity. Before I go into detail on the motif, I want to introduce the artist, Minayama Ôki (皆山応起). His civilian name was Minayama Naoichi (皆山直市) and he was an outstanding student of Ôtsuki Mitsuoki (大月光興, 1766-1834). He runned a shop or studio called Hishi´ya (菱屋) which was located at the intersection Nijô (二条) and Ogawa (小川) (present-day Nishidaikoku-chô, 西大黒町). During his studies with Mitsuoki, to whom he was also a preparer, he used the characters (応興) for Ôki and it has to be mentioned that he signed the first character (応) in the old and unsimplified variant (應). And his kaô seems to be composed of a simplified variant of this character for “Ô”. Another thing to mention is that he used not only the common radical (比) for the top part of the character “Mina” (皆) but sometimes also the, for that caracter otherwise unused, radical (此). Unfortunately, his date of birth and death are unknown but we know that he also used the pseudonyms Chikuhô (竹鳳) and Reibokudô (麗墨堂) and the name Mitsuhisa (光久). Anyway, taking into consideration his master´s active period, we can assume that Ôki was basically active from around Bunsei (文政, 1818-1830) into bakumatsu times. Picture 1: tsuba signed “Minayama Ôki” + seal “Ôki”. And now we come to the motif. The elephant was rather early known in Japan although not as living animal but in the context of Buddhism. In Buddhism, Maya (摩耶), the mother of Siddharta Gautama and the later Buddha, dreamed of a white elephant holding a white lotus flower in its trunk, appeared and went round her three times, entering her womb through her right side. Finally the elephant disappeared and Maya awoke, knowing she had been delivered an important message, as the elephant is a symbol of greatness in India. According to Buddhist tradition, the Buddha-to-be was residing as a Bodhisattva in the so-called Tuṣita heaven, and decided to take the shape of a white elephant to be reborn on Earth for the last time. Apart from that, the Bodhisattva Fugen (普賢菩薩, Sanskrit Samantabhadra) is usually depicted riding on an elephant of which some believe it refers to the same elephant Maya that appeared in Maya´s dream. One of the first written mentions of an elephant in Japanese texts dates back to the second year of Eikan (永観, 984) and is found in the Sanbô-ekotoba (三宝絵詞), a collection of Buddhist tales compiled by Minamoto no Tamenori (源為憲, ?-1011). So here again we have a Buddhist context in which the elephant appears. But at the latest by the 12th century some Japanese must had known how an elephant looks like because we can find a pretty realistic depiction in the famous Chôjû-jinbutsu-giga (鳥獣人物戯画) scroll (see picture 2). 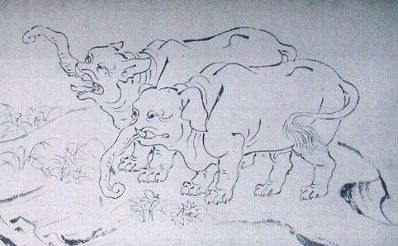 Picture 2: Two elephants as seen in the Chôjû-jinbutsu-giga. Incidentally, the elephant, zô (象), was also called kisa (岐佐) in early times. The character zô in turn is said to be based on the actual appearance of an elephant and is known in hieroglyphic form from archaic characters of early China where the animal once existed. The first recorded appearance of a living elephant in Japan dates back to the 15th year of Ôei (応永, 1408). It arrived from Southeast Asia in Obama (小浜) in Wakasa province, namely on orders of a not specified Southeast Asian emperor via a ship that came from Arabia and meant as a gift to the then shôgun Ashikaga Yoshimochi (足利義持, 1386-1428). The animal is mentioned in the record of the presents as: “One Indian elephant, two pairs of peacocks, and two pairs of parrots.” The ship landed at Obama on the 22nd day of the sixth month and the elephant about a month later in Kyôto. Three years later, i.e. in Ôei 18 (1411), Yoshimochi decided to send the elephant as gift-in-return to King Taejong (太宗, 1367-1422) of the Joseon Dynasty of Korea from whom he had received before a complete Sutra collection. In chronicles on Taejon we read that this gift-in-return was also the first chance for Koreans to see a living elephant and that the king took good care of the animal. It got 4 to 5 to (72~90 l) of beans every day but when it trampled to death some people who came to see it, the elephant was isolated until its death. The second arrival of a living elephant in Japan was in Tenshô three (天正, 1575), namely at Usuki (臼杵) in Bugo province via a Ming ship and as present for Ôtomo Sôrin (大友宗麟, 1530-1587), the local daimyô. In Keichô two (慶長, 1597), the Spanish governor-general of Luzon of the Phillipines, Don Luis de Navarrete Fajardo, presented an elephant to Toyotomi Hideyoshi. This elephant had a name, Don Pedro, and was trained to trumpet on command. It is recorded that Hideyoshi had a great joy with the animal and fed it melons and peaches. 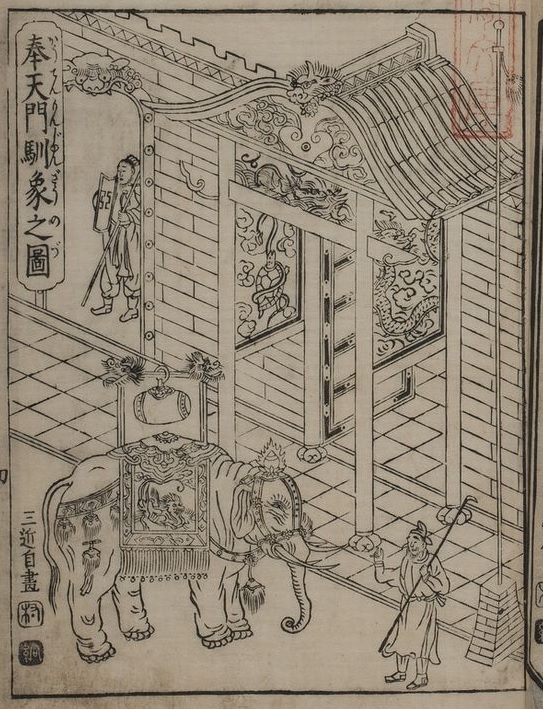 And from the Cochinchina region of present-day Vietnam, an elephant was presented in Keichô 7 (1602) together with a tiger and a peacock to Tokugawa Ieyasu. After the death of Yoshimune, no more large animal gifts were received in Japan but another male elephant arrived in Japan in Bunka ten (文化, 1813) in Nagasaki. When the British had occupied Dutch possessions in East Asia at that time and were now in the position to trade with Japan, they tried to impress the shôgn with this elephant but the present was declined. So three months after its arrival, the elephant was again put on a ship and left Japan. So the Kyôhô 13 (1728) elephant gift was as mentioned actually the one and only chance for the general Japanese public to see such an animal. 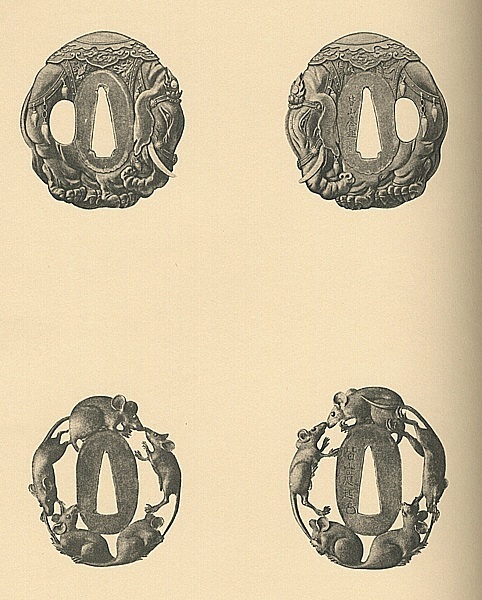 The first to apply an elephant as motif on a sword fitting (see picture 3) was Yasuchika (安親, 1670-1744) who was in Edo at that time and so it is safe to assume that he had seen it with his own eyes. He must have been quite impressed as he also made a pair of elephant menuki (see picture 4). 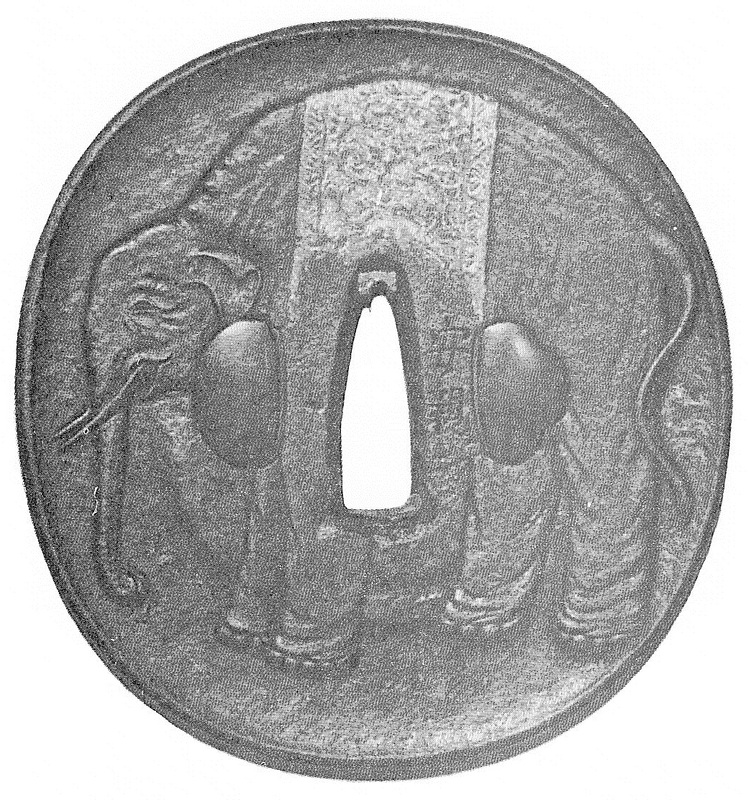 Picture 3: Yasuchika´s iron elephant tsuba (jûyô-bunkazai). Picture 4: Yasuchika´s elephant menuki. Our artist, Minayama Ôki, approached the elephant in a different way as Yasuchika. His interpretation pays attention to detail and shows all the gear with which the animal was equipped. Also the tsuba is done in katachibori-gata, i.e. the motif itself forms its outline what in turn is a measure to give a feeling of the large size and majestic appearance of the animal, although represented by such a rather small piece like a tsuba. Well, Ôki was of course not alive when the Kyôhô elephant walked through the streets of Edo so he had to rely on depictions. Looking for Edo-period elephant depictions I think I was able to find his inspiration. It is a depiction by Nakamura Heigo (中村平五, 1671-1741) presented in the Zô no mitsuki (象のみつき, “Elephants as Tributes”) published in Kyôhô 14 (1729) showing an elephant in front of the Gate of Supreme Harmony (太和門), back then called Fengtianmen (奉天門), the second major gate encountered when entering the Forbidden City from the south. It shows the very same gear and the same flaming gem as headgear. For example also the three brushtip-like ornaments dangling from the rear leather gear are identical. Ôki also copied the dragon, the symbol of the Chinese emperor, as seen on the cloth covering the back of the elephant. Picture 5: Elephant from the Zô no mitsuki. Picture 6: Detail of the elephant as seen in the Zô no mitsuki and to the right Ôki´s interpretation. 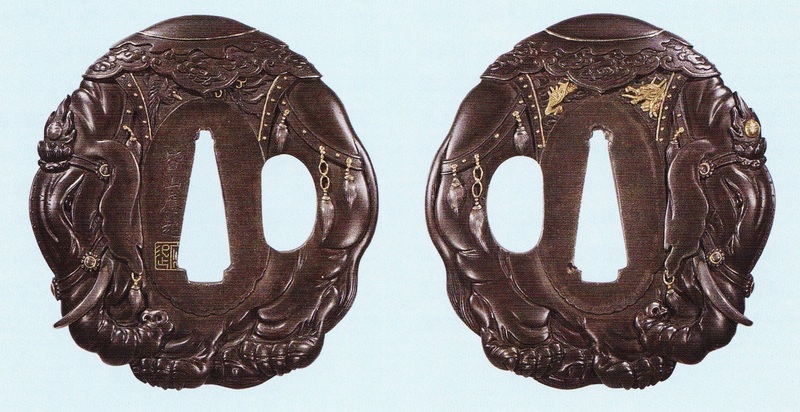 And last but not least I want to mention that this elephant tsuba by Minayama Ôki was considered worth by Mitsumura Toshimo to make it in his fancy tôsôgu two-volume set Tagane no hana (鏨廼花, lit. “Flowers of the Chisel”) published in 1904. Picture 7 shows the corresponding page of this book. More details on Mitsumura can be found here and here. At this point also a big thank you to the owner of the tsuba for giving us the opportunity to study the piece hands-on at our NBTHK-EB meeting! Picture 7: The page in question of the Tagane no hana.